The two D.C. companies are still going through due diligence before the deal, signed this month, can be finalized. The partnership would allow construction to begin in 2012, [PN Hoffman CEO Monty] Hoffman said. "We'll be staying on schedule, basically," he said. "This summer we'll be working on our master plan." He said he will seek zoning changes this fall "so we'll be staying on track with what we were planning a year or two ago." PN Hoffman will retain majority interest and managing control of the project, which encompasses 26 acres along Maine Avenue SW facing Washington Channel. The plan calls for three hotels, 800 residential units, 250,000 to 300,000 square feet of retail, offices, a marina, underground parking, and parks and promenades along the waterfront nearly a mile long. 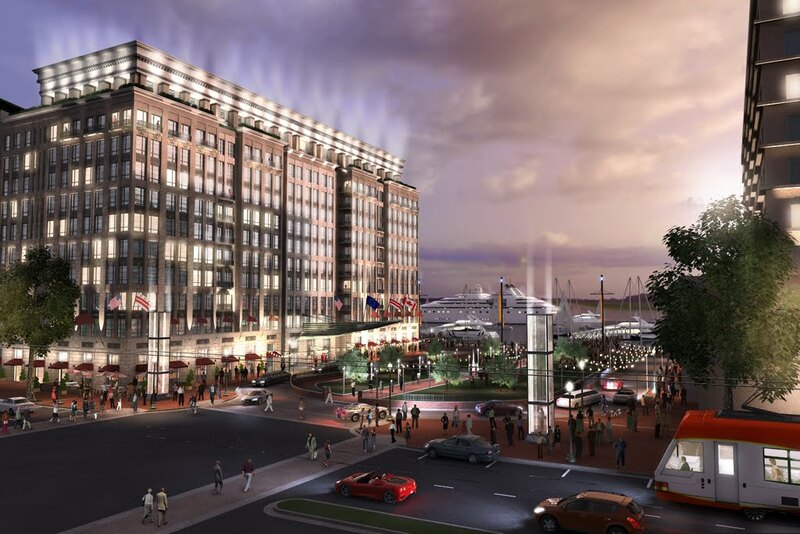 The Southwest Waterfront will be connected to the Smithsonian Castle on the National Mall via 10th Street, which is in the initial planning stages of redevelopment. L'Enfant Plaza is also located on 10th Street and will be redeveloped - the promenade is currently undergoing a $40 million renovation and I've been told some new restaurant tenants will be announced soon. 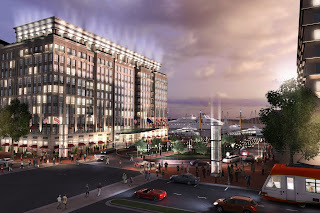 Above is a rendering of the redeveloped SW Waterfront, from the Southwest Waterfront website.